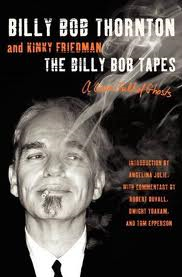 Stuff That Works - The Billy Bob Tapes - great book about Billy Bob Thornton. If you like Billy Bob Thornton at all, then I would highly recommend you read this book. The book was transcribed from tapes he made when he was sitting around shooting the breeze with some of his close compadres. One of the most enjoyable aspects of the book for me was the fact that I could hear his distinctive voice as I read the book. I have seen most of his movies and it was cool to hear him in the room with me while reading. Kinda like a tapeless book on tape. His story has a lot of elements to love. Classic Americana Rags to Riches stuff. He was born and raised in the sticks - tried and failed a couple of times to peddle his talents in big cities. Lived in his car, lived in a run down "apartment" with his buddy and they existed on one meal a day that Billy Bob brought home from the pizza place he worked at. Billy Bob had the "steady" job at that time which allowed his writing partner to concentrate on pitching their talents.